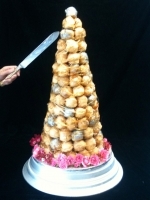 Traditionally, the top of the croquembouche would be hit with a sword, silver mallet or even a champagne bottle, cracking the top off while the bridesmaids hold up the corners of the table cloth to catch the pieces. If you are planning to do this we can supply the croquembouche with empty pieces of choux at the top, and with extra caramel for a more satisfying “crack”. We have a range of different swords available to hire. However, most couples simply push a knife or sword into the side of the croquembouche, much as you would with a traditional wedding cake. The croquembouche is then taken away to be broken up, or left for guests to help themselves – we have found that silver salad tongs are an effective serving tool, but for less formal weddings you will find that your guests are happy just to get stuck in with their fingers! 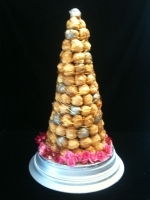 With most companies, the croquembouche is made fresh on the day of the wedding and delivered to your venue. 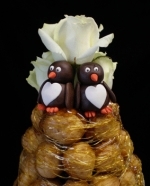 Delivery is an important factor when deciding on your budget – your croquembouche needs to be delivered as soon as it is ready, straight to your venue – the equivalent of a taxi service for cakes. Price is based on £1 per mile round trip. 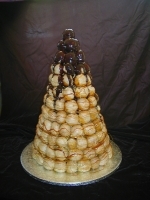 You are welcome to arrange for someone to collect your croquembouche. Although the top of a croquembouche usually comes to a peak, we can add fun sugar figures, fresh flowers or bride and groom figurines to the top if you prefer. For an evening reception a giant sparkler or candle can be inserted into the top for a dramatic effect. Chocolate works very well with croquembouche, and we can supply chocolate sauce to be drizzled over the top of the croquembouche immediately before it is cut, or as part of the cake cutting ceremony. The chocolate also helps to soften the caramel, making serving even easier. The sauce is made from dark Belgian chocolate with fresh cream. 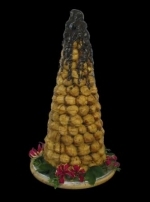 For the ultimate indulgence we can supply a chocolate fountain for your guests to dip their pieces of choux in to. How secure is a croquembouche or piece montee? It is almost impossible for a professionally made croquembouche to collapse – indeed they can be far more stable than a traditional cake. It must, however, be correctly handled, and this includes displaying it on an level table, and keeping it dry. It should not be refridgerated, and special care must be taken for marquee weddings as marquees can be very humid. I would usually advise having the cake cutting ceremony as soon as you come into the marquee or reception room, so that the photos show it looking at its very best. This also gives the caterers plenty of time to break it up before serving. 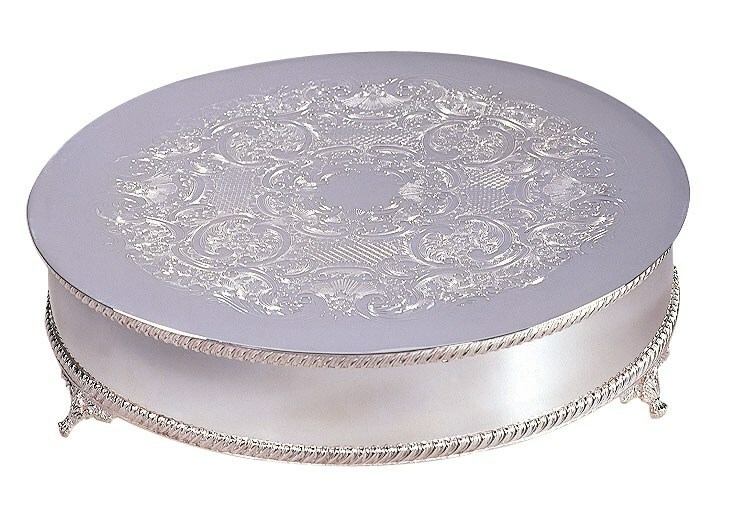 Unless your wedding venue has a suitable cake stand you will need to hire one for your wedding day. We have a great range from traditional silver plated stands to cascade, spiral and floating stands for you to choose from, along with a selection of cake knives and swords.